Offering munchies to-go or to your door, Monroe Take Out is St. John’s favourite Chinese-Canadian restaurant cooking up everything from chow mein and egg rolls to hamburgers and fries. Located in one of St. John’s beloved residential areas, Monroe Take Out is one of the area’s best kept secrets. We offer a wide menu of Chinese food favourites and a good selection of classic pub food (for the slightly less adventurous). Locals have loved to cure their cravings with the no-frills feasts for decades. When you just don’t feel like cooking or if it’s too late to make it to the store, Monroe Take Out has a plate with your name on it. We’re serving up North American-styled Chinese food that we all know and love! 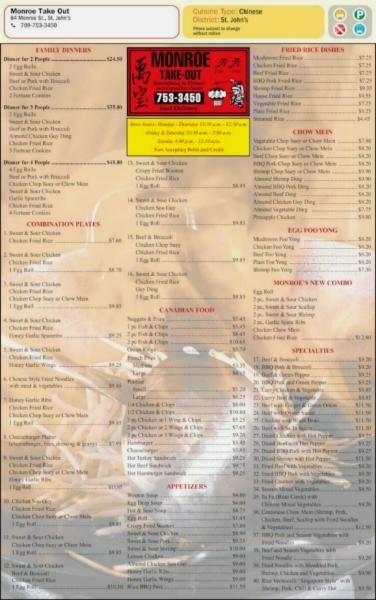 Our customers love our combos: Mix up our chicken balls, chow mein, honey garlic ribs, fried shrimp, and rice to create the right meal to satisfy your hankering hunger. The kind of food you know will hit the spot and fill you up! Maybe Chinese food isn’t your thing or your heart is just set on something else. Browse our selection of Canadian pub food like fish n’ chips, burgers, chicken wings, and sandwiches. There’s no reason why the pub’s kitchen can’t come to you. Or even mix and match and try the best of both worlds. Call us today to make an order, come on down, or sit back and wait for us to bring dinner to you.